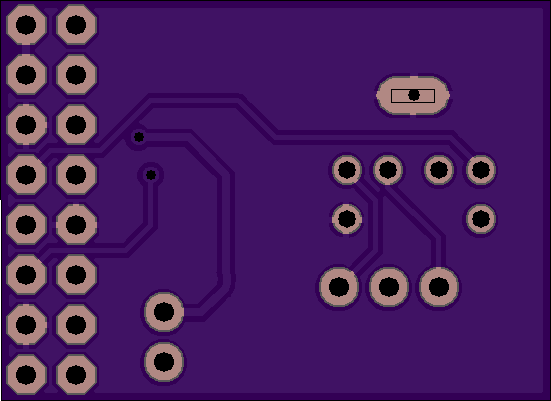 2 layer board of 1.25 x 1.40 inches (31.8 x 35.6 mm). Uploaded: November 28th, 2017 17:46. This board doesn't work. It shorts out the power supply of the GPSDO. So don't use it. This board doesn’t work. It shorts out the power supply of the GPSDO. So don’t use it. 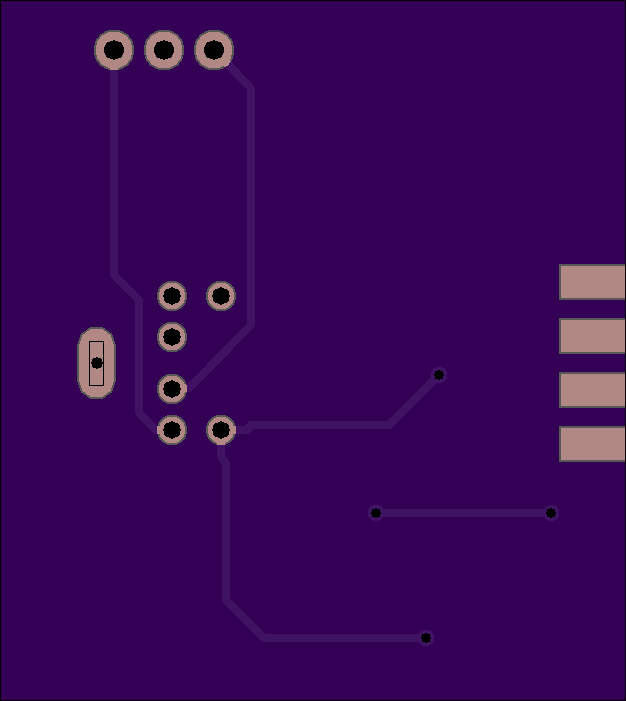 2 layer board of 1.35 x 0.80 inches (34.3 x 20.3 mm). Uploaded: November 2nd, 2017 17:51. 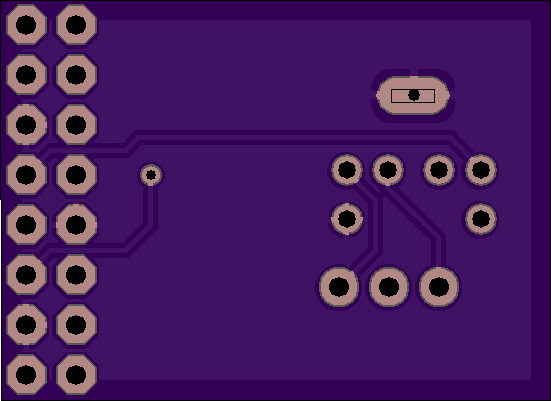 This board is an adapter for the AtmelICE programmer. The AtmelICE is a very versatile in system programmer and debugger, but it has a couple of small drawbacks. It doesn’t supply target power at all, and the cable they supply to adapt to 6 pin 100 mil sockets is kind of fragile. This board fixes both of those. You use a straight-through 10 pin 50 mil cable from the AtmelICE and then a standard 6 pin 100 mil cable to the target. 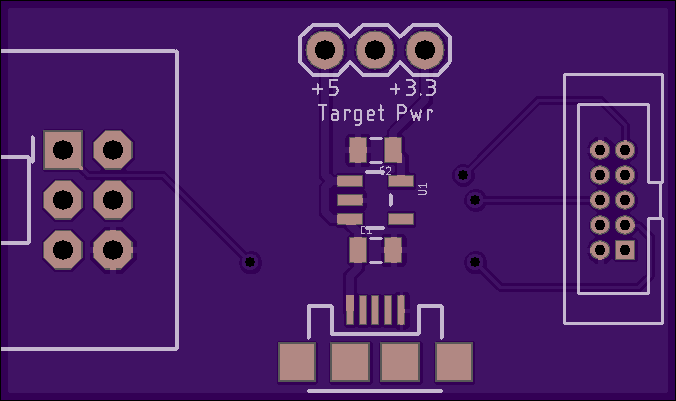 Optionally, you can connect a USB cable up to the board and a jumper will select between injecting +5 volts or +3.3 volts (from an on-board LDO) to the target power line. 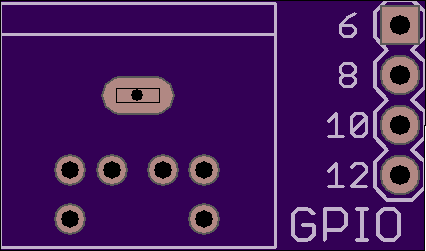 The pinout should work for ISP and PDI devices (ATTiny, ATMega and ATXmega). 2 layer board of 1.10 x 0.80 inches (27.9 x 20.3 mm). Uploaded: September 2nd, 2017 22:10. This board allows you to connect a mini-DIN 6 cable from my GPS Disciplined Oscillator’s diagnostic port to the Raspberry Pi. The correct part for the mini-DIN 6 jack is the CUI MD-60S. The 3 pin jumper block selects the serial input on the pi to be either the GPS NMEA sentence output or the diagnostic output. The transmit output of the Pi is always connected to the GPS RX pin on the GPSDO. 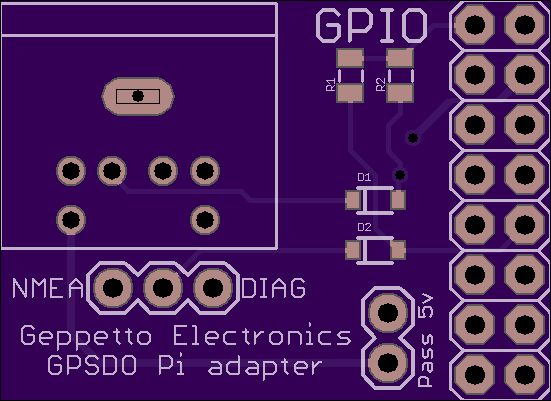 The PPS output of the GPSDO is fed into GPIO 18. The two pin jumper sets whether or not the 5 volt pin from the diagnostic header is connected to the 5 volt bus of the Pi. 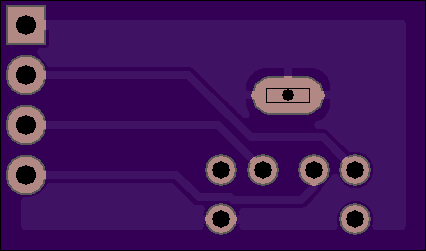 Powering the Pi from the diagnostic connector is only recommended for the FE-5680A breakout board. Added 5 volt load on the OCXO or TCXO may impact its stability. Attempting to power the oscillator from the Pi is NOT recommended. Mount a 2x8 .1" DIP female header on the bottom of the board. 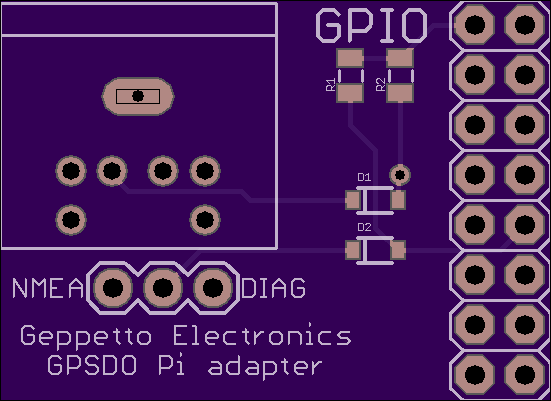 Install the board on the Pi GPIO header at the left most (pin 1) end. The mini-DIN 6 cable should exit more or less right over the SD card. The two diodes are just 1N4148s and the two resistors are 10 kΩ. Uploaded: August 8th, 2017 01:40. 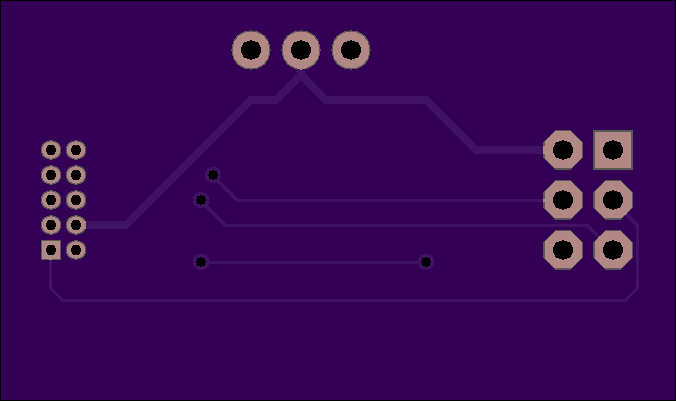 2 layer board of 0.85 x 0.50 inches (21.6 x 12.7 mm). Uploaded: August 8th, 2017 00:37. This one is no good. It needs level shifters on the TX and PPS lines. My bad. Go here instead.